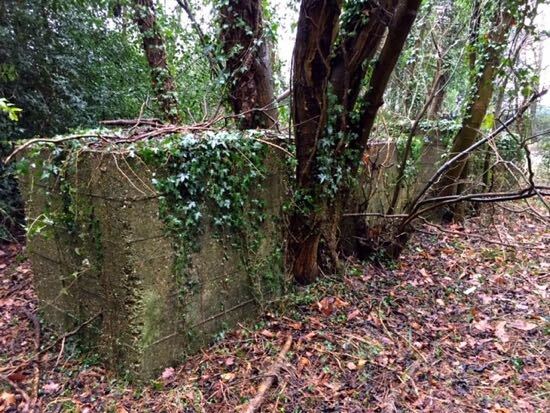 Cross the railway bridge at Brookmans Park, walk north on Station Road, turn left down Bradmore Lane, and there, hidden in undergrowth, you will see groups of concrete blocks on both sides of the lane. They are part of a network of thousands of obstacles put in place to prevent German tanks rolling through the British countryside. North Mymms has a number sites set up to deter attack. 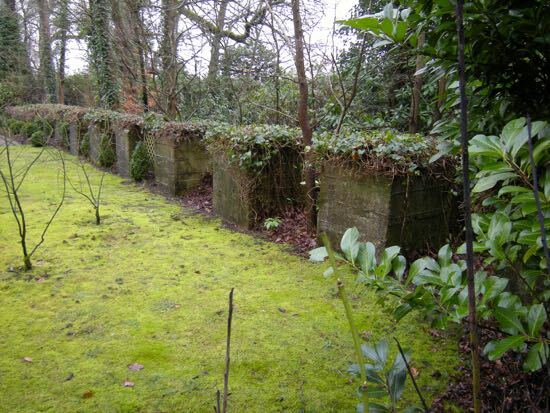 For a long time it was thought there were half a dozen tank traps in the hedgerow along Bradmore Lane close to its junction with Station Road, but in March 2018, local historian and archivist, Peter Miller, uncovered several more hidden in the undergrowth and covered in moss. Now 11 tank traps have been unearthed. They are considered to be the best example of their type in Hertfordshire and worthy of preservation. The tank traps are at grid reference TL 2405 0430. 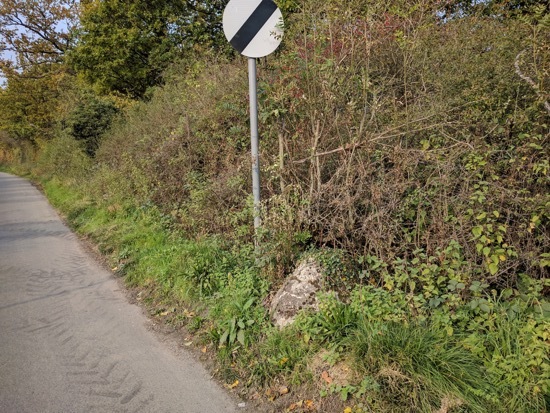 On the right, as you head up Woodside Lane from Bell Bar there are more cones, part of a nationwide line of defences stretching east to west and north to south, and scattered throughout the east and south-east of England (Grid Ref: TL 25281 05552). 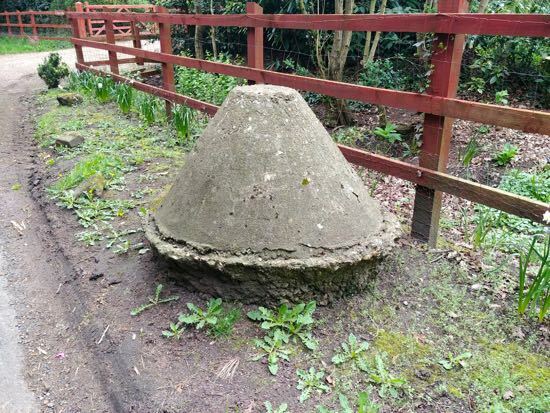 We have a feature on this site about Bell Bar's WWII Tett turret and tank traps. There are two tank traps at the east end of Swanley Bar Lane where it meets the Great North Road. 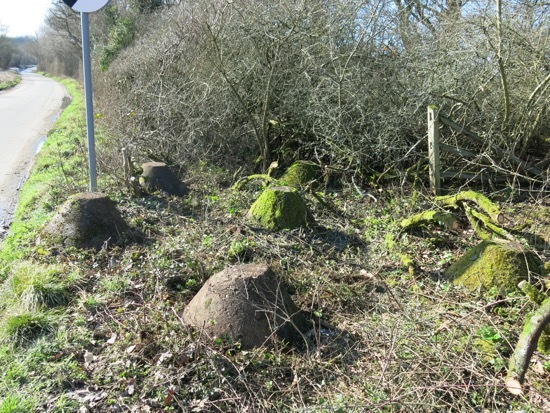 The tank traps, pictured above, are on the south side of the road, grid reference TL 26143 03166. There is a line of four tank taps in the grounds of Queenswood School, Shepherd’s Way, Brookmans Park. 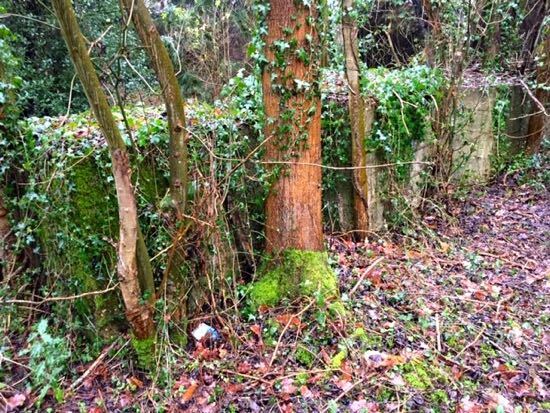 They are close to a type-24 pillbox, also in the school's private grounds. 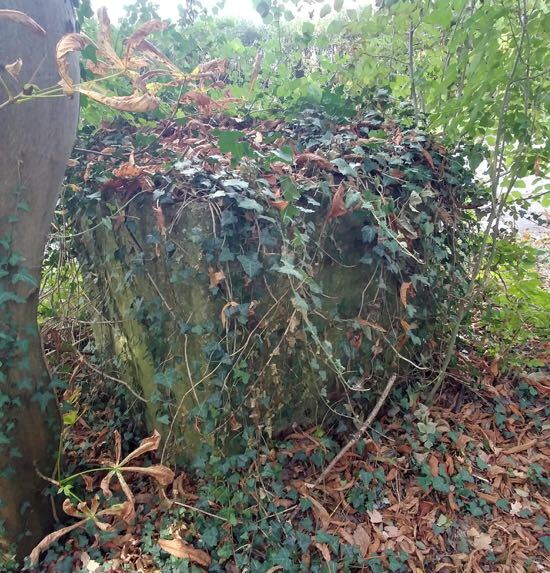 The following pictures of the tank traps were taken by the school's Archivist, Dr Wendy Bird in February 2019. 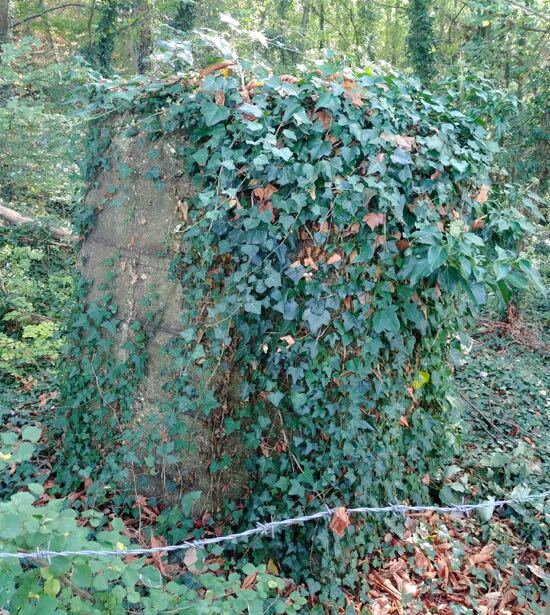 The Queenswood tank traps are at grid reference (TL 26400 03700) and the Queenswood pillbox at grid reference (TL 26600 03300). 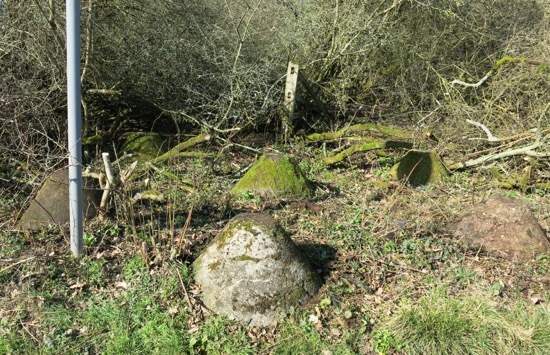 Further along Shepherds Way to the east of Queenswood close to the junction with Well Road and The Ridgway (Grid Ref: TL 271 035) is a single line of 27 concrete anti-tank obstacles (3' 6" cubes). The line is continued to the north by a bank and ditched earthwork, apparently contemporary. The bank and ditch earthwork marks the line of the parish boundary between North Mymms and Northaw. 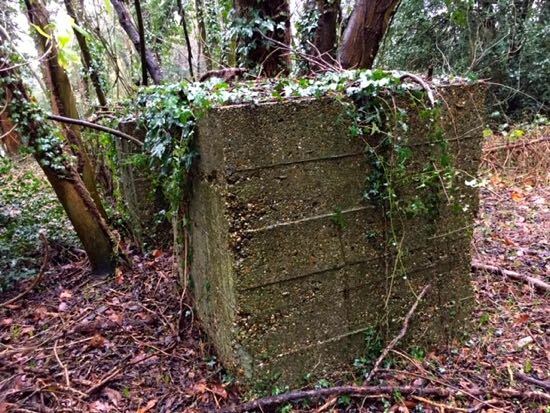 In all, there are more than 2,000 anti-tank obstacles nationwide, 7,000 pillboxes and anti-tank gun emplacements and thousands of other anti-invasion works including anti-tank ditches, observation posts and shelters. Most were set up between 1940 and 1941 and now all have been recorded as part of The Defence of Britain Archive. A line of such defences was originally planned to run from Somerset to Scotland skirting round London but it was never finished. 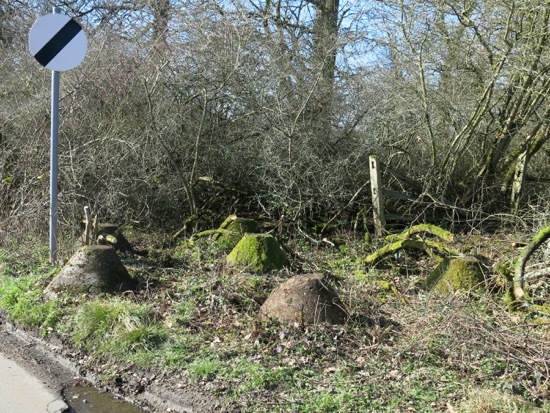 The tank traps scattered across North Mymms are part of that line. 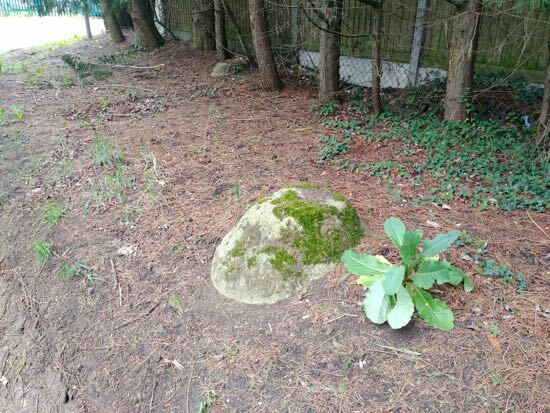 These were typically protected by earthworks, barbed wire and gun emplacements. 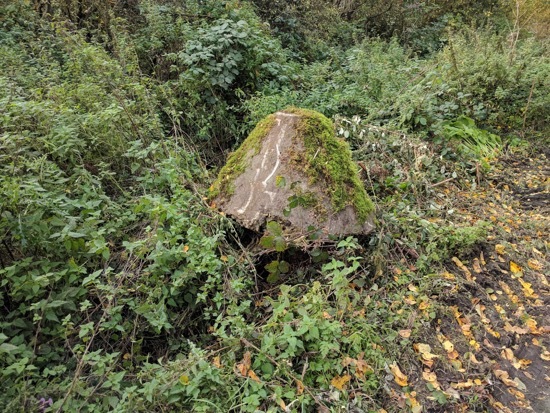 There was an Anti-tank ditch running from Brookmans Park to Cuffley, but according to the Defence of Britain archive the ditch has been destroyed. We have traced the line in the map below. Note: Any material taken from the Defence of Britain Archive has been done so with the agreement of the Council for British Archaeology. The inclusion of the data above complies with the non-exclusive, non-transferable licence granted to those using or reproducing, in whole or in part, the material for valid not-for-profit teaching and research purposes, providing the copyright owners are acknowledged. The Archaeology Data Service is the source of the material. Please see our copyright policy.